You round a corner in a museum and see a brilliant little painting, it glows with elements of pointillism and impressionism, but with unreal flashes of pure color. It looks like a Cézanne, but not quite - you look at the placard to see who the artist might be: André Derain. For every major exhibition of Impressionism, Cubism, or Fauvism, Derain risks getting relegated to a corner of the show, while superstars like Cézanne, Picasso, and Matisse soak up the spotlight. 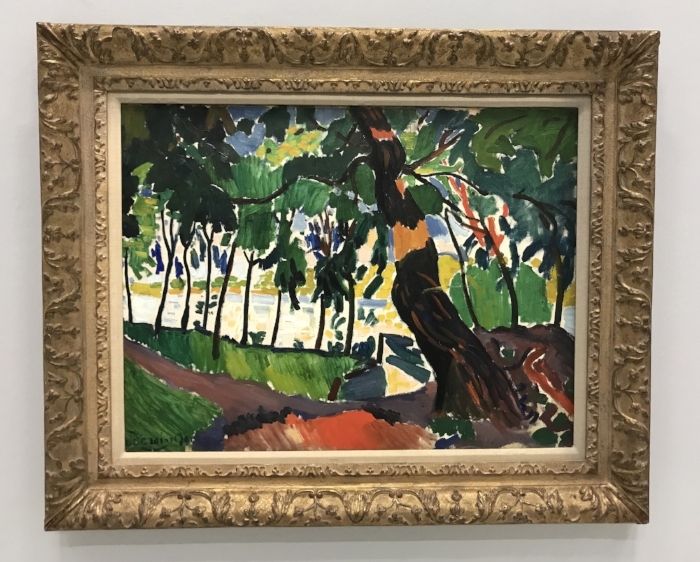 Like the impressionist Alfred Sisley, André Derain's paintings hold up as excellent, yet he is much less known than he could be, or should be. One hundred years later, Derain's works still manage to show us something new. The Pompidou' Center's show of Derain gives this relatively-underrepresented superstar a generous second look. In this portrait Derain stays true to his own style without straying into pointillism and also manages to capture the form of Matisse's glasses and pipe. It's not easy to use green on a human face, yet he balances this well in the addition of deep oranges and peach. Matisse was lucky to have Derain as a student, fan, and follower. Derain painted landscapes as Matisse worked more with interiors, both artists bringing intimacy to each realm. Another moment where Derain mastered the River as a theme below, where the canvas holds short strokes of color for the water, and unbroken blocks of color when it comes to boats, shadows, and buildings. Elements that move - grass, fast water, or wind, break up Derain's strokes. Stagnancy, bricks, and monuments are built out of flat planes of paint. I'd argue most of Derain's best work was done when he was making paintings like these. As Derain absorbed stylistic influences from Matisse, Cézanne, and cubists like Braque, he created a feedback loop between these painters and each of their separate movements. Later in his young life, Derain's canvases took a darker look and he worked more with cyrstallized forms. The artist spent five years as a soldier in World War I, stationed in a damp forest. The show of his work at the Pompidou ended with works like Portrait of a Girl in Black - altogether more lonely and gray pieces and overly classical compared with those that you see here. So, why is Derain so underrepresented? 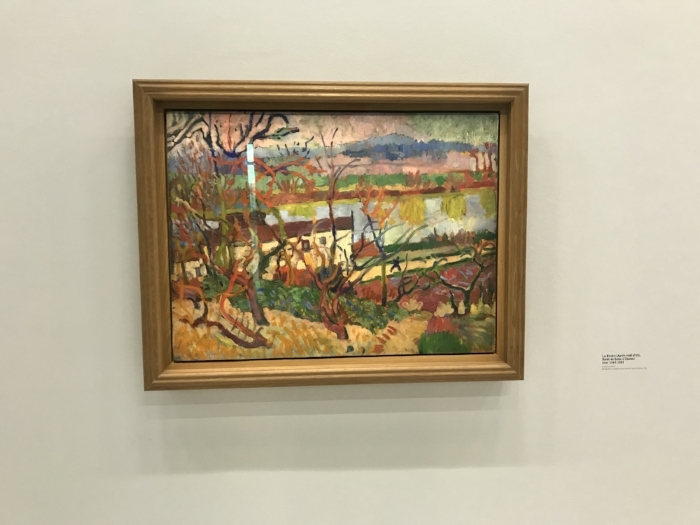 It may have to do with the fact that, later in his life, Derain made the mistake of accepting invitations from Nazi Germany to visit a Nazi-officiated German art show. (There are many more at-length debates about this). 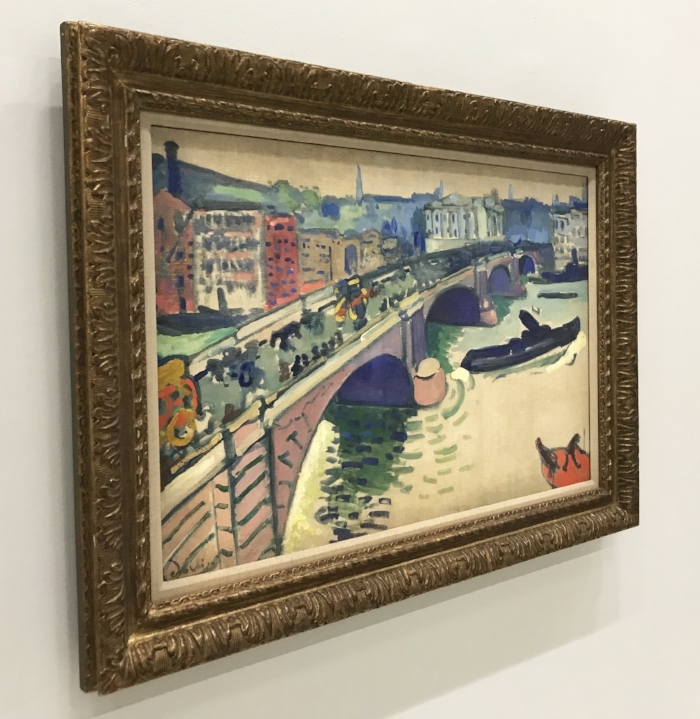 Did Derain willingly collaborate, or, as a citizen of Nazi-occupied Paris, did he have no choice but to do what the Nazis said? (Threats such as 'go to our show and endorse our German art, or we will break your hands' come to mind) The sheer energy of thinking, researching, and debating around this controversy seems to cast a cloud over the artist as a whole. 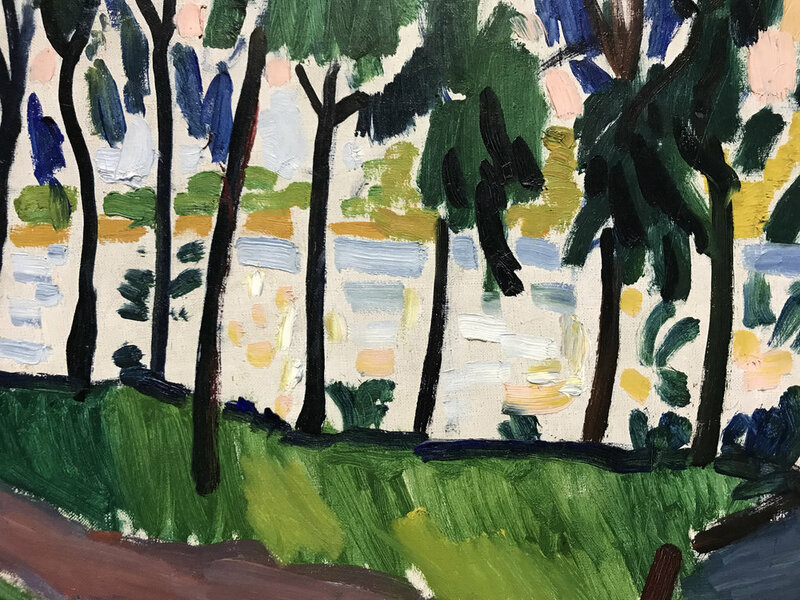 I imagine Derain's earlier pre-war self - the self who painted riversides and idolized Matisse - as inhabiting the only time period where the artist was truly free and truly great. The Pompidou show does a good job of showing us this Derain. Two world wars and the influence of competing styles ultimately made Derain's paintings worse - when Derain tries too hard to be Cubist, Classicist, or Pointillist, an inkling of stylistic self-imprisonment repels us away, and modern viewers cruise onward through the galleries to the next painting.